The ICC World Twenty20 Qualifier gets underway on 9th July and will feature 14 Associate nations competing across eight venues in Ireland and Scotland. The teams will vie for the six available spots in the first round of the purported ’16-team tournament’ in India next year. Group A consists of Ireland, Nepal, Hong Kong, Papua New Guinea, Namibia, United States and Jersey. Afghanistan, Netherlands, United Arab Emirates, Scotland, Kenya, Canada and Oman make up Group B. A total of 51 matches will be played, culminating in the final at Malahide on 26th July. The two group toppers will go through directly while the teams placed second to fourth in the respective groups will undergo playoffs to decide the remaining four places. Of course, the claim of the 2016 event being a 16-team tournament is plain hogwash. Just as in 2014, the tournament proper will consist of only ten teams and thus an Associate nation may or may not make the grade. That the Netherlands actually finished ninth last time around will count for nothing as the Oranje will have to go through the grind of qualification all over again. By contrast, Bangladesh and Zimbabwe, who finished in the tenth and thirteenth positions respectively, have got an automatic bye into the first round by virtue of their full-member status. How is that for ‘meritocracy’? Rantings aside, the eighteen-day long tournament can be expected to provide plenty of entertainment and fans of Associate cricket will no doubt be hooked to follow the fortunes of their favourite teams. The shortest format of the game throws up the likeliest opportunities for players from lesser-known cricketing nations to display their wares and a host of exciting players will be in action. We look at 14 such players – one from each team – who will be worth keeping an eye on. The long-haired Zadran can be a real treat to watch when in full flow. With a potent ability to generate pace and bounce, this aggressive left-arm seamer is a vital part of the Afghan bowling attack, which is arguably the most potent in the tournament. Batsmen will have to think out of the box in creating scoring chances off him. He tends to wear his heart on his sleeve and his emotional celebration after Afghanistan’s famous win against Scotland was arguably the defining image of the 2015 World Cup. In the 2012 World T20 he had given India a scare with a productive spell which showed that he clearly loves the big stage. The Pakistan-born Pervez has proved to be an effective fast bowler for Canada in recent times. His team has been on the downward slide but his efforts – nine wickets at 8.67 – in the ICC Americas T20 in May might have given hope to the Canadians of competing in seamer-friendly conditions. He will be expected to play a major role in the absence of talented off-spinner Nikhil Dutta who is plying his trade in the CPL. Afzal will not only be captaining Hong Kong but will also be spearheading their bowling attack. The right-arm paceman has the tendency of picking up early wickets while also maintaining a plug on the run-flow. He recently proved his worth with a dazzling spell of 5/17 in a 50-over game against Namibia, which saw the African side crash to 30/8. Besides, he is quite handy with the bat. If Hong Kong are to repeat their performance of 2013, a lot will depend on Afzal’s form. The 24-year-old Balbirnie has been touted to be Ireland’s future batting star and he has backed those expectations by establishing himself in the middle-order. He can be both technically sound as well as highly innovative which is an ideal mix for T20 batting. His excellent fielding and tricky off-spin only adds to the package which underlines his value to the defending champions. A 96-ball 129 against a strong New Zealand A side followed by a breezy 97 against Zimbabwe in the World Cup showed that he is maturing at the right time. With the home crowd on his side, ‘Balbo’ should be looking to make an impact. Hosts Jersey edged past established sides such as Denmark and Italy to win the ICC Europe T20 in May and thus book a berth in the qualifier. A pivotal part in this success was played by Jenner, a 17-year-old who also doubles up as a wicketkeeper. He was the leading run-scorer for his team with a tally of 160 at an excellent strike rate of 177.78 which included a destructive, six-laden 81 off 34 balls in the opening game against Norway. Most will expect Jersey to make up the numbers but if this hard-hitting teenager gets going, things might get interesting. Off-spinner Ngoche topped the bowling charts in the ICC Africa T20 Championship with a haul of 11 wickets at 7.36. His bowling style is suited to the shortest format – he has an economy rate of 6.24 in T20 cricket – and Kenya will be hoping that he comes good. The erstwhile kings of Associate cricket need something special to revive their fortunes and a substantial showing from Ngoche might just be the key. Klazinga has been one of the most consistent performers on the Associate circuit for quite some time now and the qualifier presents the seasoned fast bowler another opportunity to inspire Namibia into a world event. Boasting of a T20 average of less than 20, his experience and versatility should assume a lot of importance in conditions starkly different from what the Namibians usually play in. Nepal finished as high as third in the previous qualifier in 2013 and went on to make an impact in the first round by defeating Hong Kong and Afghanistan. Their passionate fans will no doubt be hoping for a similar result and a lot will ride on how the team’s diverse bowling unit performs. The most exciting of the lot is 19-year-old Sompal Kami, who will look to utilise the conditions to the fullest. He is capable of generating enough speed to unsettle the best of batsmen and a few early strikes from him will hold Nepal in good stead. The Dutch have grown to become a bellicose T20 unit and quite a bit of credit needs to go to Malik’s medium-fast bowling. Whether opening the bowling or coming in the middle overs, Malik has smartly displayed the knack of collecting wickets at key moments. He was a leading performer in the 2014 World T20 where he finished as the joint-highest wicket-taker with 12 scalps including 5/19 against South Africa. In the just-concluded four-match series against Nepal he took 11 wickets averaging seven and it will be a surprise if he does not carry this form into the qualifier. Kaleem’s left-arm spin befuddled many a batsman during Oman’s victorious ACC T20 Cup campaign in January. The Karachi-born cricketer can be an asset as shown by his ten wickets at 10.4 and an economy rate of 5.42. He is also a handy batsman. If Oman are to compete against stronger teams, Kaleem may prove to be their trump card. 22-year-old Siaka’s aggressive stroke-playing is tailor-made for the T20 format and he can be expected to launch opening onslaughts and lay the platform for the batsmen to follow. 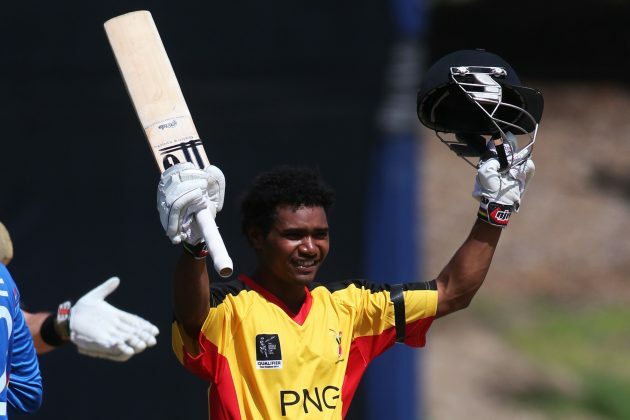 He inspired PNG to a win in their very first ODI series with a typically attacking 109 against Hong Kong last November. Siaka had announced himself earlier in 2014 with centuries against Kenya and Namibia that helped his team secure ODI status. The Barramundis failed to progress last time and the presence of Siaka will undoubtedly boost their chances of doing better. Co-hosts Scotland will be looking to extract the most out of Leask – the hardest hitter of the ball in the team – to ensure their passage. Leask has the ability to make a huge impact with the bat in a short period and it is bursts such as these which often decide a T20 match. Last year he smashed five sixes en route a 16-ball 42 in an ODI against England, clearing the ground with ease. Besides, his off-spin can be used as a surprise weapon. Home territory provides him the perfect opportunity to achieve the dual goal of enhancing his reputation and securing his team’s progress. By far the best batsman in the UAE squad, Anwar had an excellent 2015 World Cup where he logged 311 runs at 51.83 including a hundred against Ireland and fifties against Zimbabwe and Pakistan. The Sialkot-born shipping employee will be a source of inspiration for his teammates, especially since the long-serving Khurram Khan has now retired. He possesses a varied range of shots and is able to adjust according to the situation. A lot will depend upon him if the UAE are to progress for the second consecutive time. USA may have lost the Americas T20 final to Canada, but opener Babar was the standout batsman of the tournament. He totalled 242 runs at an average of 121 with a best of 78* that guided an edgy chase against Bermuda. The loss of Steven Taylor to the CPL is significant and Babar will be expected to play the role of the batting pivot for his team.